There are a huge number of wearable activity trackers on the market, but few of those are directed specifically at women, an issue Bellabeat aims to fix with the Leaf. The Leaf is an activity tracker that looks more like a stylish piece of jewelry than a standard tracker from a company like Jawbone, Nike, or Fitbit, disguising itself as a "leaf" accessory able to be worn on the wrist, collar, or neck. Like many activity trackers on the market, the Leaf tracks steps taken and sleep quality, but when paired with the app using Bluetooth, it also tracks menstruation and ovulation and it offers guided breathing exercises to reduce stress when worn around the neck, setting it apart from other fitness offerings. 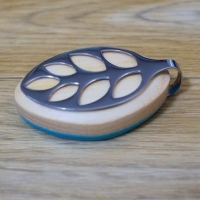 Hardware As the name suggests, the Leaf is a Leaf-shaped accessory consisting of a stainless steel backing, a wood base (American Ashwood) housing the activity tracker and battery, and a stainless steel leaf-shaped clip that fits over the wooden portion. With the clip, it can be worn on a shirt collar or hem (less than 2mm thick), and with attachments at the top and bottom, it can be attached to a chain and worn around the neck or attached to a leather loop and worn around the wrist. Both the necklace chain and the leather wrist strap ship with the Leaf. Size wise, the Leaf weighs 0.64 ounces and measures in at 1.89 inches by 1.18 inches and it's a half an inch thick. I am petite with small wrists and it fit on my wrist using the tightest wrap setting. It was comfortable to wear on my wrist, but it looked bulky on me.